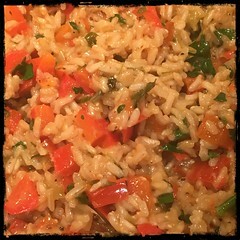 Wikipedia states that a ‘Pilaf is a dish in which rice is cooked in a seasoned broth.’ They also say that ‘cooked onion, vegetables, as well as a mix of spices may be added.’ With this particular variation, we keep it rather simple as diced onions and red peppers are the key ingredients. 1. Sauté green onions (or onions and garlic) and hot pepper flakes (optional) in 2 tbsp olive oil. 2. When the onions show signs of transparency add butter. 3. When the butter is melted, toss in the uncooked rice. Mix well and let cook for a few minutes. 4. Add 1/2 cup of wine and allow the rice to absorb the liquid (mix often). 5. Once the liquid has been absorbed, add the first cup of stock along with a bit of salt and pepper. Keep mixing and cook until the liquid has been absorbed. 6. When the liquid is absorbed, add the diced red peppers, mix well. 7. After a few minutes add the final cup of stock. 8. As the rice absorbs the last of the liquid, add the oregano and lemon juice. 9. Taste the pilaf to gauge whether you need to add anymore salt and pepper. 10. Once all of the liquid is absorbed add some flat-leaf parsley.